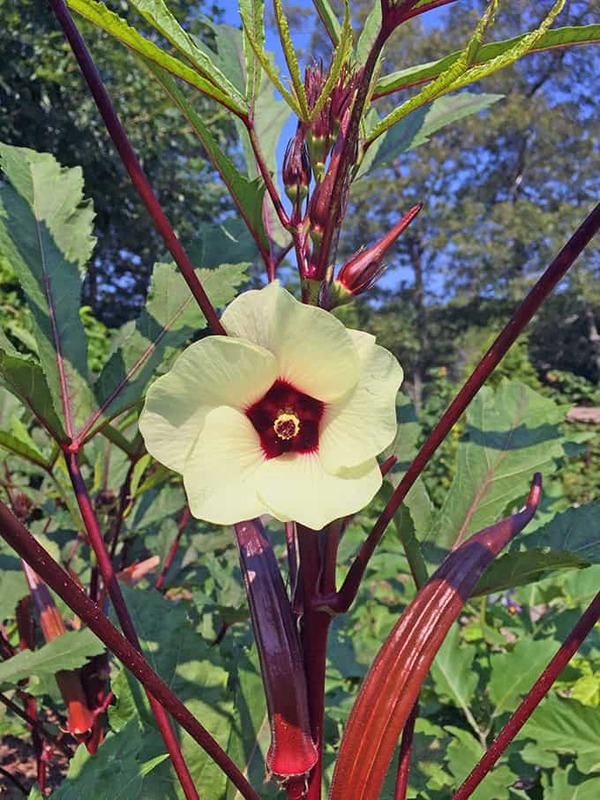 Type of Plant: Okra comes from northern Africa, and this red version was developed at Clemson University and was introduced in 1983. It is a tall growing plant that is a member of the mallow family and is both ornamental and edible. 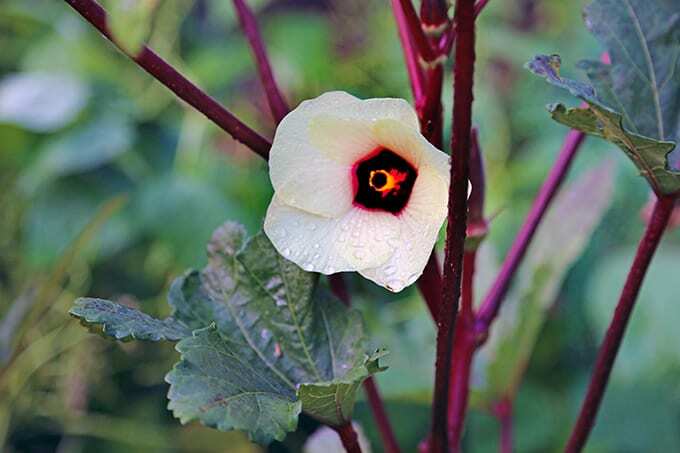 Why I Love/Hate this plant: The flowers on this okra look similar to other mallows – like a hollyhock or a single rose of Sharon flower. 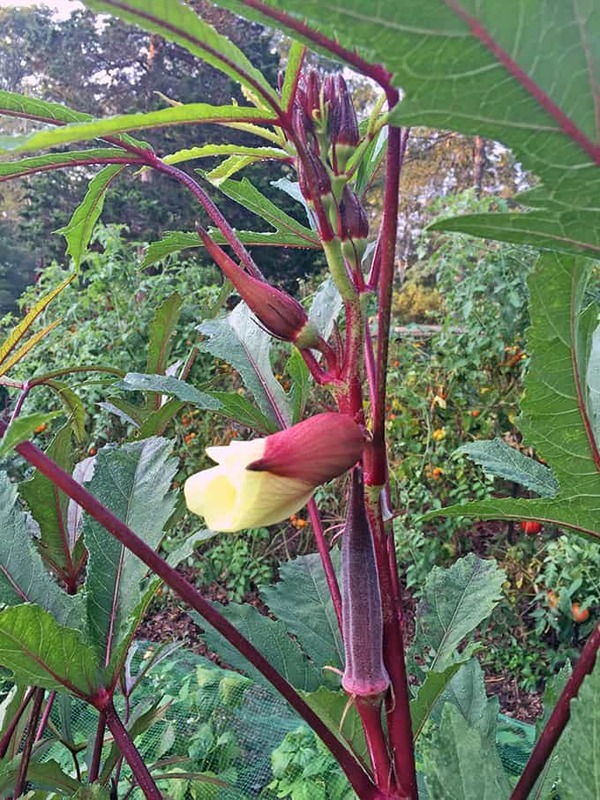 The stems are burgundy in color and the okra pods are upright and fast growing. My plants grow to five feet tall over the summer. Frankly, I love this plant more for the ornamental aspects than for its value as a vegetable. A Word to the Wise: If you love okra and want to grow enough for meals, plant three rows of at least ten plants each. The pods need to be picked when very young to be tender, and each plant only produces about one pod every other day. So in order to have enough for a meal you need many plants, and the more people you want to feed, the more rows of okra you need. Grow this plant in full sun. It doesn’t mind heat. The flowers are also edible – I see it recommended that you should deep fry them, and all I can say is that anything deep fried is delicious, even cardboard. Frankly, I grow this plant to put into the perennial garden for pretty, upright annual flowers and burgundy pods in the late summer. You can see that this plant is in the Mallow family – it looks so similar to many hibiscus. The stem and pods are as ornamental as the flowers.